There's good reason to compare the new iPhone 8 models to the Galaxy S8 lineup. These are some of the newest devices from two of the most popular phone manufacturers who just so happen to have a longstanding unofficial rivalry. Considering how loyal fans of these two brands can be, you probably already have a dog in the fight, but it's always good to see what the other side has to offer. Since we won't be able to do a hands-on comparison for another week or so, we got down to the nitty-gritty and pitted the iPhone 8's spec sheet against the most comparable offerings from Samsung. This, plus our existing knowledge of the Galaxy S8's software and hardware experience, gives us a pretty clear picture of the pros and cons for each device. Take a look at the chart below to get a good idea of how these industry-leading phones stack up against one another. We divided it up to help you compare the larger and smaller models separately. But while you're reading, keep in mind that these are just specs, and a lot more goes into a phone's overall user experience than what appears on paper. Some of the standout features with Samsung's Q1 2017 flagships include an almost bezel-less display, which, at 83.6% or more, has an even higher screen-to-body ratio than Apple's $1,000 super-premium iPhone X. Samsung's fast wireless charging protocol lets you charge up to 1.4 times faster than regular Qi with compatible chargers, and their IP68 water-resistance rating means you can go deeper underwater than the iPhone 8's IP67 rating would permit. Another few wins for Samsung include the expandable storage slot, which lets you pop in a MicroSD card to get an extra to 256 GB of space for all of the photos, videos, and other media you store on your phone. And while we've yet to see how Apple's fast charging compares to the Quick Charge 2.0 tech in the new Galaxy lineup, Samsung includes all of the necessary equipment to leverage this feature, while Apple will charge you at least $74 extra. Finally, the S8 and S8+ both have a headphone jack, so regular earbuds won't require a dongle. For the iPhone 8 and 8 Plus, one of the major advantages is that it'll be running iOS 11, the latest operating system version available, right out of the box. 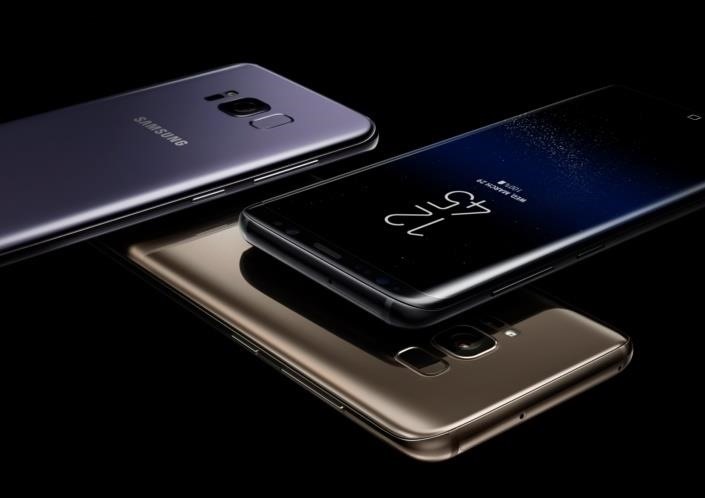 Apple will continually update the firmware so that you're always running the latest and greatest, but the Galaxy S8 and S8+, on the other hand, are currently two major versions behind Android Oreo. Apple gets one more clear win with the stereo speakers on the iPhone 8 and 8 Plus, and both models do cost $25 less than their Samsung counterparts. Finally, while both flagship lineups include the latest top-of-the-line processor available to them, Apple's A11 chip has already been shown to have far better performance than the Snapdragon 835. The iPhone 8 and 8 Plus, however, will come with iOS 11, which doesn't match Samsung's TouchWiz UI in terms of the sheer number of features, but offers a simpler and more intuitive interface. Since Apple has designed both the software and hardware, the two work in harmony and typically offer a smoother experience than Samsung's flavor of Android. Overall, there's plenty of room for debate, and we'll know more when we can get our hands on both phones. But on paper, at least, the Galaxy S8 models are the clear winners, so we'll anxiously await some real-world testing to see if our expectations are met.